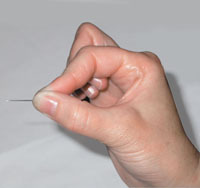 Humans are capable of a "precision grip." 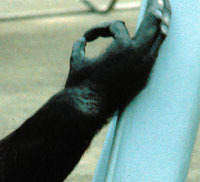 "Chimpanzees with their reduced thumbs, are also capable of a recision grip, but they frequently use a modified form." "For as long as man has observed the behavior of monkeys and apes he has been fascinated and amused and perhaps most often felt uneasy or even self-conscious. For inevitably he has sensed a similarity--in appearance and behavior--a reflection of himself. Today increasingly, he is learning that the similarity is not simply superficial. Man is a primate, a member of the order that includes monkeys and apes. Bound by evolution they have much in common--more than most people ever dreamed even a century ago." This should be called Prosimians, Monkeys, Apes and Humans. they are trying to study how our primate ancestors "met the challenges of living on the ground"
Adrian Kortland believes that the apes were once more advanced, more "manlike" and that "man [sic.] himself forced them back into the forest, and back in time." the environment is "the primary architect of any society;" it is the "molder of behavior"
one young female 1 1/2 years old invented washing, and this was copied by others and is now "part of the culture of Koshima"
each group of macaques has its own "traditions"
author of The Naked Ape, The Human Zoo, Cat Watching, Dog Watching. 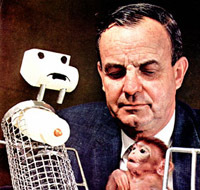 . .
Horr (1973) writes the following: Monkeys, Apes, and Man was produced by the National Geographic Society and Wolper Productions for a general television audience. This immediately poses problems for the filmmaker, who must walk a tightrope between "view ability" and scientific accuracy. This film manages to do both with reasonably high consistency, although the professional primatologist will wince at some interpretations or better, nuances, which accompany otherwise exceptional sequences. The film covers a wide variety of material and contains some truly outstanding film sequences which makes it a invaluable classroom document--with appropriate corrections by the instructor. The film opens with excellent footage of mountain gorillas from Diane Fossey's current study. Unfortunately, the scenes are brief and, for the primatologist, marred by narration which claims that Ms. Fossey is dispelling for the first time the myth of the gorilla's viciousness. Her work is filled with important new insights into gorilla behavior; however, that particular myth was destroyed over ten years ago by George Schaller. Following this introduction and the titles is a section on evolution. Films of the Scopes Monkey trial and the "Evolution Revolution," a chimpanzee rock band, are followed by excellent footage on slow loris, uakaris, proboscis, and other monkeys and a beautiful sequence of black and white colobus leaping through the trees. With arboreality thus established as the base of all primate adaptation, our attention is shifted to baboon footage by DeVore which illustrates the role of predation and dominance in keeping terrestrial primate inclose, social troops. 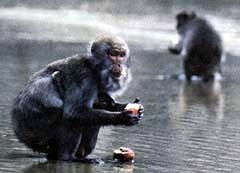 The role of the primatologists is again introduced by shots of Guy Eaton and his wife observing a colony of Japanese macaques at the Oregon Primate Center with some comments about monkeys as emissaries from another species telling us about ourselves. Brief shots of Japanese macaques living in winter snow lead into some interesting footage of Koshima Japanese macaques swimming. Comments are made about washing, swimming, etc,. as learned, possibly, "cultural" variations, but perhaps to include, as the viewer is left to assume too much or too little about this most important phenomenon. The sequences of Kortland's experiment placing an animated, stuffed leopard in front of an unsuspecting chimpanzee troops are among the most valuable of the film, especially since, unlike some other sequences, I do not believe this had ever been released elsewhere. It is fascinating to see the chimps attack the "leopard' with large sticks, although careful inspection shows that they really do not (in the footage shown) ever use the stick as a club, but only throw it in the general direction of the leopard. This magnificent footage (it is worth seeing the film only for it) is marred by nearly inane comments about chimpanzees "perhaps" sensing that all animals must die, since they behave as though the leopard is dead once its head has been knocked off and it is stiff to the touch. Another concept left hanging is Kortland's idea that chimps are degenerated human beings. The study of socially deprived macaques is neatly illustrated with some new footage form Harlow's lab, a succinct picture of his major findings and a good introduction to the world of cloth and wire mothers, peer group importance, and therapist monkeys. Among the best sequences are the Gombe Stream chimp scenes of predation (chimps eating a monkey; the capture is not shown), tool-using to termite and vocalization. A long sequence of chimps exhibiting extreme dominance reactions over a surplus of bananas is fascinating, but it is unlikely, as the narration states, that it was an earth shattering revelation that food would stimulate such behavior in chimps, or other primates for that matter. The film closes with views of Jane Goodall teaching her child, Grub, in the jungle and an interview with Desmond Morris in which certain platitudes about the future of man being to regain his "animal humility": etc., are expressed. Despite some problems of narration, much of this film is interesting and very valuable. It is useful in the introductory class because it does entertain as well as inform. . . .